The Boys Philly Showcase attracts elite talent and college coaches from across the country to one of the top venues on the east coast, United Sports in Downingtown, PA. The 10-Year Anniversary of the Boys Philly Showcase attracted over 600 athletes and 180 college coaches from the Division l, ll, and lll levels. Players traveled from 27 states and Canada to compete at this one-day event. The Showcase featured athletes from 2020, 2021 and 2022 graduation years. Players competed throughout the day to be selected for the Fab 40 All-Star team. All-Star recipients received a Nike gear pack with bag, hat, t-shirt, and jacket and an Epoch gear pack with a shaft, early released Z-One strung head, sideline bag, and Integra gloves. Prior to the start of the All-Star games, an impressive face-off battle, King of the X, took place on field one. 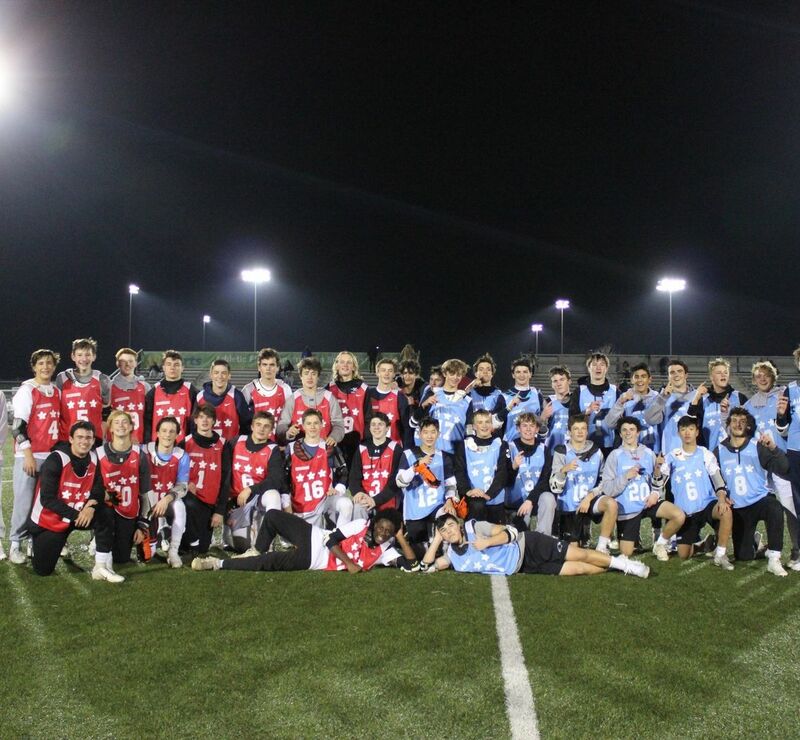 Face-off players, surrounded by college coaches under the lights, battled for the elusive title which was captured by 2021 FO Richie Hughson from Kennett/Freedom. The Fab 40 All-Star games from all three grad years were filmed by NLV Productions and will air on Lax Sports Network this week. Follow our social media channels for updates on times. Featured below are four of the top 2022 lacrosse players that Brett Manney has highlighted as Manney's Men for this year's showcase. Brett Manney is an assistant captain and standout defenseman for the New England Black Wolves. He also won a bronze medal with USA's National Indoor Team, where he was also an assistant captain. He played on Delaware's 2007 Final Four team, captained the 2008 team, made the North-South All-Star Game and is the driving force behind Showcase Lacrosse's nationally-known events. Manney sees players from all over the country at NXT's events, including those in Georgia, Maryland, Michigan, and Pennsylvania. He also coaches the NXT 2019 team, which allows him to see many of the country's elite players. Here are the players who stood out the most to him at the Philly Summer Showcase. Reilly hails from the Long Island powerhouse and could be the next great attackman to do an “M” on his helmet. One of the best lefty attackmen I have seen in a long time, Reilly is super talented and showed that this past weekend. He can score from the wing, behind the cage, and off the ball. When he dodges, he possesses great stick protection and despite being a bit smaller than the defenders guarding him, he still gets to the rack. I love his fearless attacking style and he's a catalyst, do-it-all lefty attackman who should be the focus for defense every time he steps on the field. It would be hard to fathom guarding him and honorable mention BBL teammate, Matt Wrede, at the same time. One of the best young coaches in the high school circuit is Brian Phipps. I have been impressed with all the talent he has collected at Spalding in the past two years. At the forefront of a great youth movement is the do-it-all middie from the Annapolis area. Weisshaar goes hard after groundballs on face-offs, takes pride in defense, and is a total animal transitioning the ball downfield. On offense, he creates great separation on his dodges and had a big upside to be an elite midfielder. Jones is one of my favorite young defenders I have seen in a while. An LSM who plays hard between the lines and loves to have the ball in his stick, Jones is a beast. The rich only get richer, as Jones takes his talent to McDonough which has been breeding unbelievable defensemen recently. When the ball is on the ground, Jones finds a way to get his stick on it, gets it out of the pile, and then it's an automatic fast break. His speed out of the defensive end is lethal. Once he becomes a bit more savvy with his stick, he will be a great offensive-minded LSM for years to come. Skipper had the luxury of having Henry Bard anchoring his defense but whenever there was a breakdown, the young netminder had great vision tracking the ball. Brayden was great up top and his quick reflexes on close shots are what separated him from some of his peers who were equally as impressive. When I was watching Skipper, he was fantastic and should only get better as he gets older. I look forward to seeing him compete at Showcase events in the future.